Bonjour mes amis! Comment êtes-vous? Avec moi, c'est très bon! Sorry, I’ll switch back to English now. My French always improves whenever I visit France. But that’s a different story and a different post! 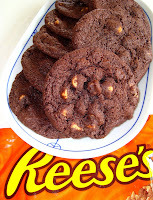 On to Reese’s® Chewy Chocolate Cookies: I’ve been wanting to bake these cookies for a while now, and my anticipation grew each day. Unfortunately, they did not live up to my expectations. They were somewhat disappointing for several reasons: 1) They didn’t turn out as pretty as I hoped they would be (or at least as pretty as they look on the Reese’s® peanut butter chips package). 2) Despite their name, these weren’t chewy at all. They were rather crisp. I think the reason they weren’t that chewy, is because the recipe doesn’t use any light brown sugar. 3) The cookies tasted fine. Not spectacular, not too bad. If you want a really good chocolate cookie recipe, I recommend Martha Stewart’s Double Chocolate Chunk Cookies. Rating: 3 out of 5. - Stir together flour, cocoa, baking soda and salt. 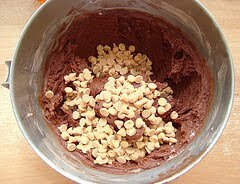 Beat butter and sugar in a large bowl with mixer until fluffy. Add eggs and vanilla; beat well. Gradually add flour mixture, beating well. Stir in peanut butter chips. 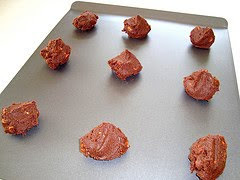 - Drop by rounded teaspoons (mine were rounded tablespoons, I prefer larger cookies) onto ungreased cookie sheet. Bake 8 to 9 minutes. Cool slightly; remove from cookie sheet to wire rack. Cool completely. 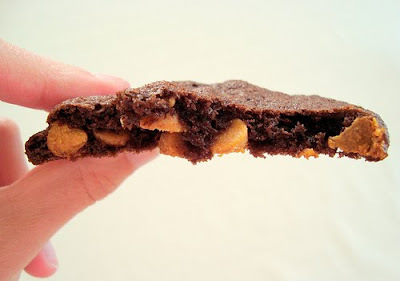 Chocolate and peanut butter together has got to be the invention of the (previous) century! Tomorrow I'm trying ice cream sandwiches with these. I hope you are having a beautiful and blessed Mother’s Day! Along with the cookies, I baked a Vanilla Bundt Cake. My mother and grandmother adore Bundt cakes! Coming back from vacation just yesterday, I didn’t have a single thing in my house; no sour cream, no buttermilk, no lemons, nada. So the only option for me was to mix butter, sugar and flour together and pop it into the oven! And it makes the most sublime cake ever! I hope you enjoyed your trip to France! 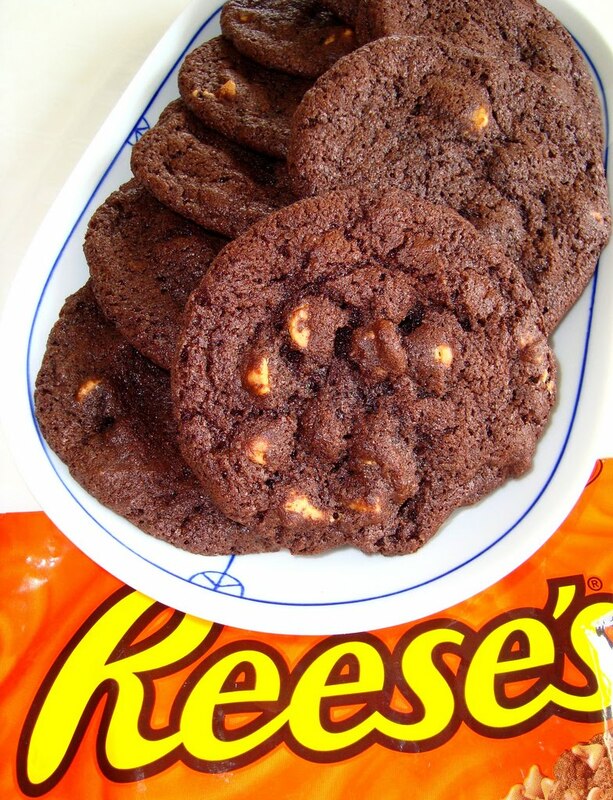 What a disappointment for the Reese's cookies, because a chocolate cookie with reese's chips sounds so good! Wow! These look delicious! I will have to try them. I have never seen a cookie like that! Aw, I love reeses pieces. Would love to try a cookie that tastes like them!